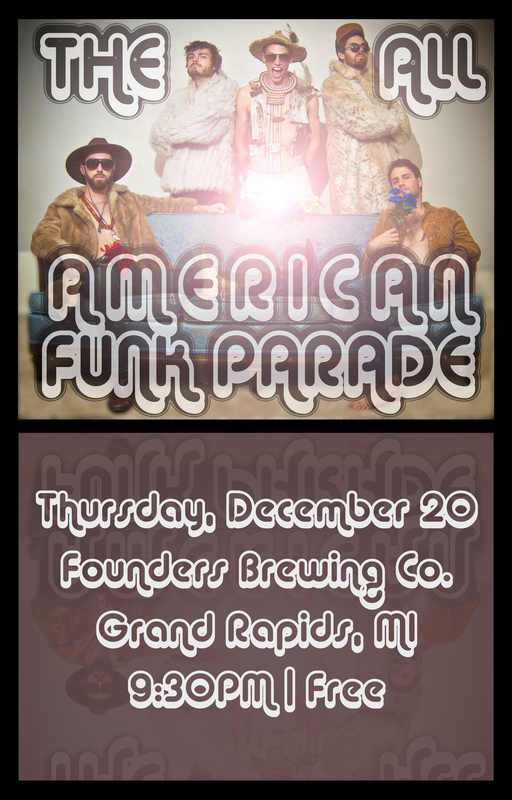 The All American Funk Parade - Founders Brewing Co. The All American Funk Parade will take all of the things that you thought you knew about yourself and smash them together in a big bowl and stomp on them until they all mashed into moosh and then they will pour Barbeque Sauce all over it until it oozes over the sides and dribbles onto the floor where you and all of your loved ones will DANCE ALL OVER IT UNTIL YOU NO LONGER KNOW WHO THE F#@% YOU ARE. Ever since first playing his fender stratocaster as a young cadet, Josh Moyer has been refining and expanding his expertise in funk, jazz, and rock & roll. His sound is distinct, like a bright shooting star in middle of nightfall. His harmonies and melodies show us true beauty, while his performance and presence sends a feelings comfort and adventure. Duncan Tarr, originally from town of Merrimac, Massachusetts, has shared his musical talents in many different ways than one. His lush lows gives us true thrust into unkown realms. His violin-like highs sing like voice of truth and certainty. All-the-will his percussive pops and thumps give a new name to ‘Hip’ and ‘Booty’. We salute to you, Stache. From the bottom of the basement of Montie house to the tallest of rocky mountain peaks, the drums send you on a sonic experience. Ryan McMahon felt the drums from a young age. He understood that with study, trust, time, and feel, a solid foundation could be build to support such an extreme boost. With his grooves and navigational skills, any adventure could explore the deepest reaches of sonic space. Now, with roots across Michigan, The Rocket Boosters wish to make a salute the musicians and artists that have existed before our time. We understand that we, like our peers, the musicians before us, and the musicians that will carry the torch when we are gone, are like books in a library. With one foot in the past, and the other stepping forward, we ask you to join us on our next adventure. BOOST!